I was thumbing through a paddling catalogue the other night, looking for new wetsuit booties, when it occurred to me that a wetsuit top might also be in order. Lake Michigan is expected to be colder than last year due the huge influx of melt-water this spring along with cooler temperatures. One maxim I adhere to when out in my sea kayak, is: “Dress for immersion.” I don’t doubt its wisdom. And, I’ll admit, it is one of those things I wrestle with when it gets hot outside. I’d rather dress for the air temperature – maybe in some nice nylon shorts and a quick-dry top. But, I stick to the rule any time I go out in open water, where executing a self-rescue, or assisted-rescue with the help of a friend, might result in being immersed more than a couple of minutes. Time is not your friend when waters are very cold. That evening, while browsing, I was reminded of an old friend and colleague; he died from hypothermia many years ago while kayaking offshore near Wilderness State Park on Lake Michigan. Things had gone terribly wrong. He ended up in the water dressed far too lightly. Tragically, he succumbed. Sadly, things might have gone otherwise. His wetsuit was stowed in his kayak. Dressing for immersion is just one of many important lessons I’ve learned over the years while attending paddling symposiums. Those are lessons you don’t get when you purchase a kayak. And, it is easy to set aside any related worries when you first get one home. Then, sometimes, it’s too late. 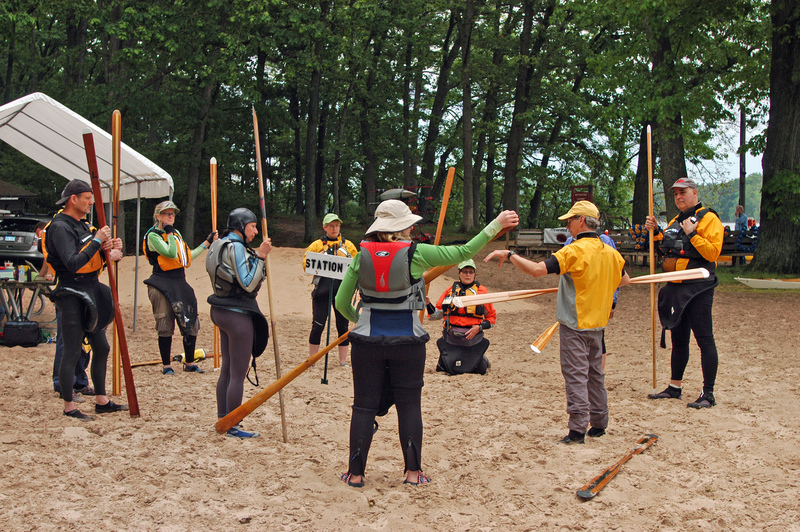 Three excellent Michigan paddling symposiums offer those lessons for paddlers. Each is fun, busy and playful; they are venues where beginning and expert paddlers can push their own envelope. 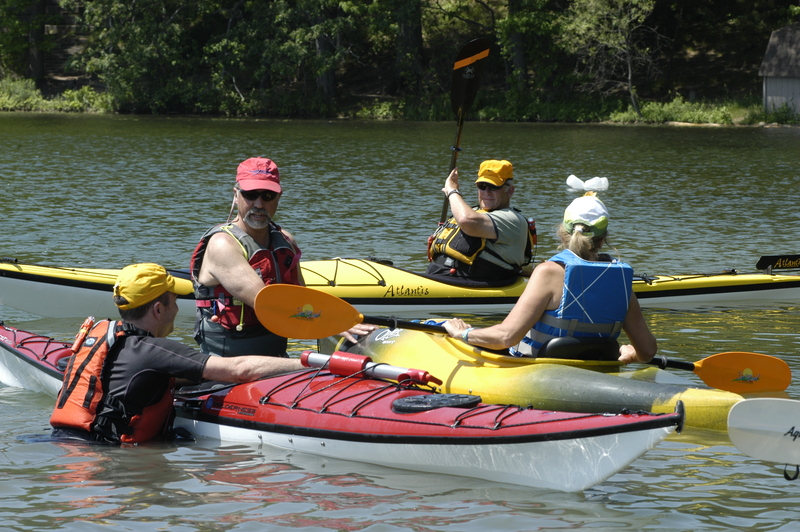 The symposiums offer lessons as basic as how to put a kayak on the car, or to how to modify a cockpit for a secure fit, along with more advanced topics like navigation, self-rescue, how-to-roll and different paddling styles and strokes. 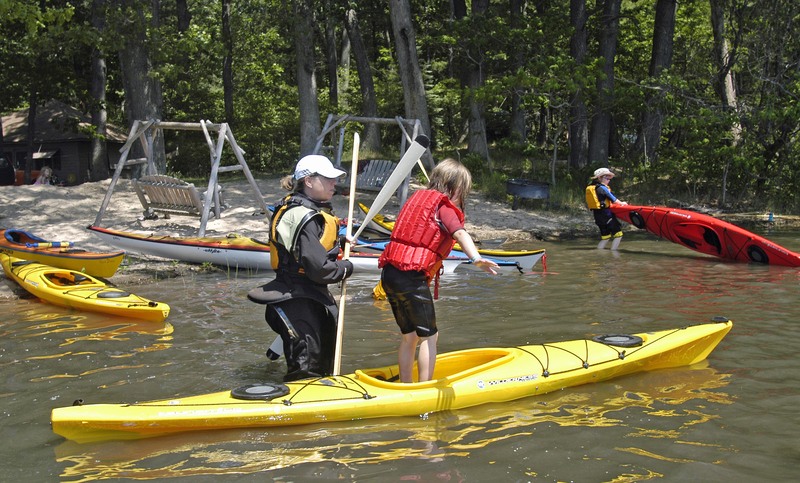 “Our big focus is bringing kids and adults safely into the sport kayaking and stand-up paddleboards,” said Steve Adsmond, president of West Michigan Coastal Kayakers Association which hosts a popular Memorial Day weekend event every year at Camp Pendalouan, on Big Blue Lake in Muskegon County. This year’s WMCKA Sea Kayaking Symposium is scheduled May 23-26, is its 25th anniversary. Its curriculum is tailored for beginning and intermediate paddlers. Details can be found online at: wmcka.org. Two guest speakers at the WMCKA symposium are: Shawna Franklin and her partner, Leon Sommè, who circumnavigated Iceland in 2003, along with noted paddler, Chris Duff. The trio paddled more than 1,600 miles in 81 days. The trip earned Franklin the honor of being the first woman to do it. You can bet their talk will be fascinating. Downwind Sports also sponsors “Ladies of the Lakes,” August 15-17, in Munising. As you might guess, it’s for women with classes for beginning and expert paddlers including basic strokes and boat control, towing techniques, bracing, rolling, and leadership. I didn’t make any decisions the other night. Browsing booties and wetsuits led to dreams of a new life jacket, some additional dry bags and maybe a new paddle. I put the catalogue down and penciled a list. Living with a budget means prioritizing buys. The wetsuit jacket sat at right at the top. This entry was posted in Uncategorized and tagged Kayaking, Paddling, Sea Kayaking, Sea Kayaking Symposium, West Michigan Coastal Kayakers Association, WMCKA. Bookmark the permalink.